October was a pretty average reading month for me. Seven books read, all enjoyed, you can't ask for more than that. 56. A Swiss Vendetta - Tracee De Hahn. To be reviewed. The thing that sticks out for me is that there's no non-fiction this month and the one I'd just started I've put aside for the time being. Will have to do better than that next month. I've more or less majored on crime novels, surprise, surprise... five of those and two supernatural themed books. Sometimes you just have gorge on your favourite genre because nothing else will do, this is possibly because I've had a cold for a week and needed some comfort reading. 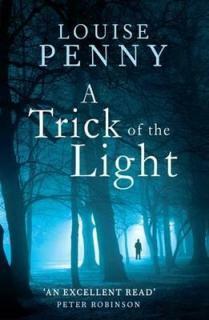 A Trick of the Light by Louise Penny. Superb, the series just gets better and better. I've already reserved the next book from the library. 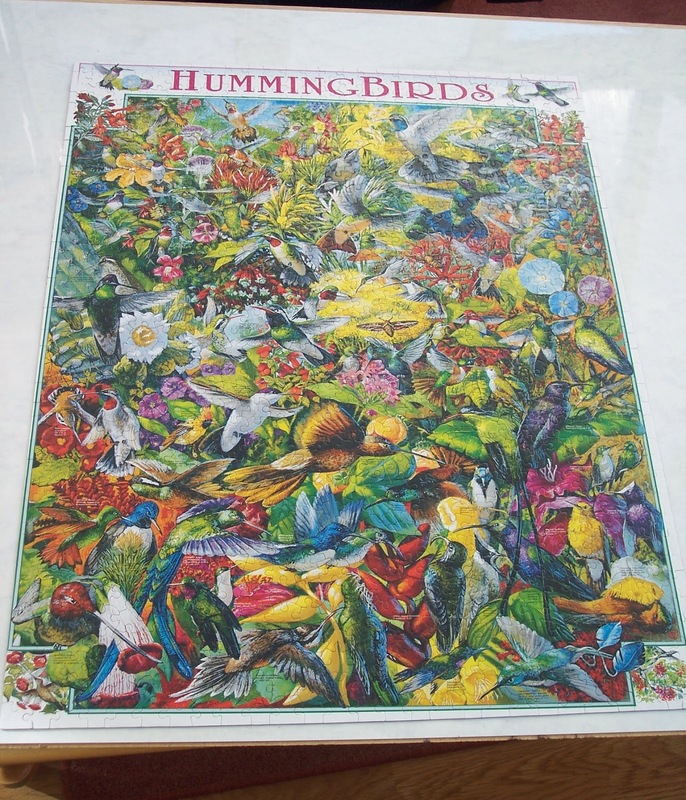 And this one was a 1,000 piece American puzzle entitled 'Hummingbirds'. I'm hoping November will be a quiet month. I don't mind if the weather is bad because settling down in my favourite chair in front of the open fire with a good book is sheer luxury. I call it 'hibernating'. Happy reading. You never cease to amaze me!! After nearly 4 weeks of no reading (surgery and company) I finally finished another Anne Perry book. Lovely reading month! My brother loves the Dana Stabenow books. He is blind and reads them on talking books. I too am looking forward to the hibernating months, stocked up on puzzles and books. Just started reading the Ruth Galloway books by Elly Griffith. Really enjoying them. As I've shared with you before, I've loved several of the authors and books you mentioned. Every time someone talks about a Louise Penny book I am tempted to go back and reread all of them. Perhaps I'll do that next year (or maybe listen to them). Your puzzles are lovely. 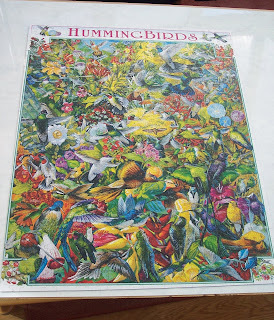 Your hummingbird puzzle looks quite challenging. Congrats on a great reading month as well. Pat: Well done! Love how much you're loving the Anne Perry books. Peggy: It's wonderful that your brother can still read, technology is a brilliant thing. Thrilled to hear you've started on the Ruth Galloway series, it's one of my absolute favourites. Kay: I'm really into the Gamache series at the moment, not sure why. The Beautiful Mystery has come in and I'll collect it from the library next week. If you did reread them all that would be the Canadian book challenge completed. LOL! I've just started my first book for that. Diane: Yes, that was quite a difficult puzzle, so much colour, a lot of it of it all looked the same. You had a good month - just doing those two puzzles would mean I wouldn't be able to read 7 books! 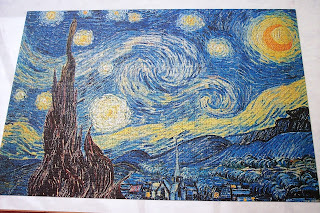 And Van Gogh's 'Starry Night' with 2,000 pieces - amazing - and the colours in 'Hummingbirds'are just so beautiful. I must get out my puzzles - especially the one I started last winter and never finished. 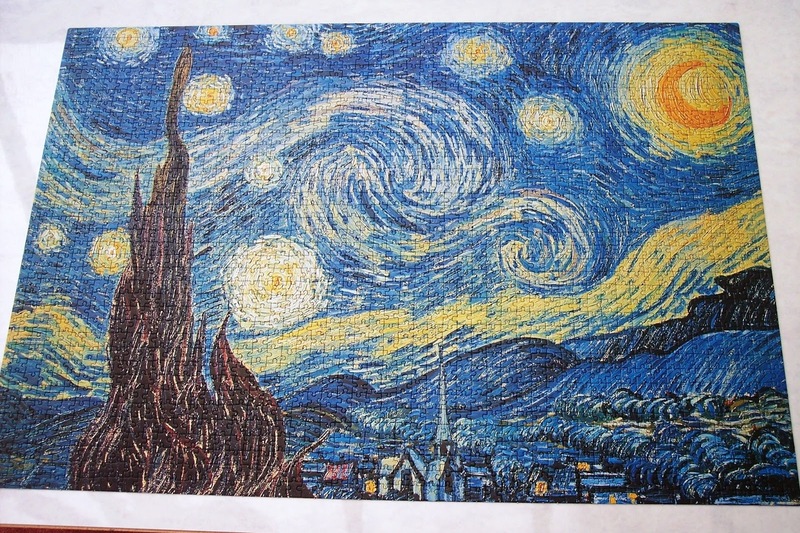 Margaret: Starry Night was really difficult but hugely enjoyable. I'm left with a new respect for Van Gogh's work as I could see every brushstroke of course. Stunning. I loved doing 'Hummingbirds' too. Such a pity you don't live closer as we could do a puzzle swap. Tracy: I wasn't sure about the Bruno books when I read the first one. He's a bit too good to be true if I'm honest. But the French setting is lovely and there are some interesting other characters. It took me a while to get back to Dana Stabenow after reading that first KS book but I'm glad I did. I've learnt such a lot about life in Alaska. Louise Penny is on my all-time favourite authors list, I just love her Gamache books and they really do get better and better. Yes, set in Canada! Perfect.